Shakti Gawain is a writer and speaker in the areas of creative visualization, meditation and enlightenment. Publisher’s Synopsis: Each day, we have the opportunity to awaken to the larger world, the natural world, those around us, and our own goals. Grasping this opportunity can be challenging, but it is possible. Information overload, lack of time, and an inability to connect with essential spiritual teachings conspire to make our journey to consciousness daunting. In this revised edition of Awakening, pre-eminent spiritual teacher Shakti Gawain offers gentle daily guidance for that journey. Amazon Synopsis: Creative Visualization is the art of using mental imagery and affirmation to produce positive change. Employing her proven method, Shakti Gawain teaches how to trust intuition and act on our inner truth as a means of both releasing and developing creativity in every area of life. This kit offers her dynamic tools for transformation: a supportive guidebook, a visualization journal, 25 printed affirmation cards, and 25 illustration-only cards for individually-customized affirmation cards, all packaged in an elegant portable box. Amazon Synopsis: Personal-growth pioneer Shakti Gawain presents her definition of prosperity: not bankrolls and material possessions, but rather a fulfilled heart and soul. Interviewing people about their views of prosperity, she has found that most, regardless of their wealth, feel a serious lacking in their overall sense of well-being. Using a fresh approach, she challenges the Western tendency to equate money with happiness, encouraging readers to examine their longings honestly, follow them to their roots, and separate them from false desires or addictions. Writing with authority and warmth, Gawain shows readers how to create true prosperity in satisfying relationships and the kind of happiness not dependent on possessions or circumstances. Amazon Synopsis: Newly updated, revised, and redesigned, this popular workbook companion to Gawain's phenomenally successful guide to personal growth and fulfillment offers readers hands-on methods for designing and implementing a completely individualized blueprint for positive change. Amazon Synopsis: If embraced and followed, intuition can be an accurate force that permeates all facets of life. Shakti Gawain teaches readers how to tap their innate inner knowledge and use it to enhance their lives and attain their goals. Chapters explore the role of intuition in health, creativity, work, and prosperity. Exercises based on Gawain’s workshops help readers listen to their inner guide but also evaluate the worthiness of such knowledge in the context of the real world. Stories from her clients and her own life illustrate the practical advice she gives. Amazon Synopsis: Drawing on years of clinical experience, the authors take readers on a remarkable journey of self-discovery. The "sub personalities" that live with the self are explained, allowing readers to pursue their individual destinies. Amazon Synopsis: In this profoundly exciting and challenging time, individuals may find they are involved in a difficult yet fascinating learning process -- both their personal evolution and the evolution of human consciousness. In this book, best-selling author Shakti Gawain describes the four levels of human existence -- spiritual, mental, emotional, and physical -- and explains the importance of developing all four. She also provides the meditations and exercises readers need to begin their own healing journeys. Amazon Synopsis: First published in 1991, this new edition is twice as long and includes all the original meditations as well as those from more recent works that focus on intuition and prosperity. These meditations can be used to help readers and practitioners tap into creativity; connect with their inner guide; explore the male and female within; and much more. With a new introduction by the author, this is a perfect companion for the millions of readers who seek “private” guided meditation from this inspiring teacher. Amazon Synopsis: Most people face challenging personal issues - in jobs, relationships, finances, and health. Traditional ways of living, working, and relating to one another and the environment often don't seem to work well, yet there are few effective models for change. 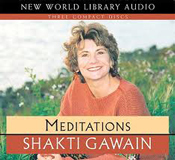 Shakti Gawain shares the ideas and perspectives that have been the most helpful to her; guides readers in healing physical, mental, emotional, and spiritual wounds; provides tools for dealing with difficult situations; and proposes that the solutions to personal and planetary crises are within each human being. Amazon Synopsis: This book gives readers an inspirational thought and a useful tool — an original affirmation — to be read each day. Each entry has a heading, a short message or meditation, and an affirmation. Readers not familiar with Gawain’s work can refer to the glossary and index for more clarity. A new introduction by the author and a new contemporary design are also featured. Amazon Synopsis: The bestselling author of Creative Visualization and Living in the Light reveals the most private and initimate details of her extraordinary life and shares experiences and feeling that connect at a profound level with readers everywhere. Line drawings. Amazon Synopsis: Get into the Tantric Way. BE HAPPY, men and women together. Amazon Synopsis: This companion to Creative Visualization details the practical technique of using mental imagery and affirmation to produce positive life changes. In each meditation, the author describes specific images and directs the listener through the meditation process. Amazon Description: Based in part on two of the most popular exercises in Creative Visualization, this audiobook introduces concepts and features meditation designed for repeated listening. Amazon Description: Gawain works with the theories of Hal Stone and Sidra Winkleman to bring forth the fun-loving inner child, allowing for more intimate relationships and a more enjoyable life. Amazon Description: Focusing specifically on becoming more creative, Gawain discusses concepts and leads listeners in exercises and meditations. Amazon Description: Gawain shows how to bring into balance and harmony the male and female forces found within each individual for a healthier emotional life. The female is intuitive and compassionate; the male active and strong. Amazon Description: For many people, getting started with relaxation techniques, for health or other reasons, can present a real challenge. This recording introduces easy and effective guided meditations to help change the way people respond to anxiety. Thousands of people have found these simple techniques helpful in achieving a more balanced lifestyle. Stress Reduction and Creative Meditations offers self-care for anyone coping with the demands of an overbooked schedule, a hectic pace, or life in an increasingly complex world. On Track One, Allen's soothing voice combines with quietly inspiring background music to gently guide the listener through complete physical relaxation, a vital first step toward stress reduction. The creative meditations on Track Two allow the listener to accomplish inner work on health, abundance, financial success, fulfilling relationships with others, and attainment of life purpose.